Ralph Richardson, Yakima, WA, 1958. - Purchased damaged from USAF for $835. -- Aircraft had been damaged during gear-up landing. Earnest Lee & Arb Osen, Yakima, WA, Oct. 1958. Wenatchee Air Service Inc, Wenatchee, WA, Dec. 1958-1962. 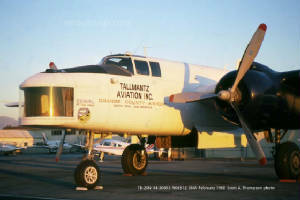 Tallmantz Aviation, Santa Ana, CA, May 17, 1962-1985. - Fitted with camera nose for use as camera ship. - Used in movie "Catch 22", 1968-1969. Dennis M. Sherman/Sherman Aircraft Sales, West Palm Beach, FL, 1985-1987. Dean Martin/Consolidated Aviation Enterprises, Burlington, VT, Nov. 1987-1989. Universal Aviation Corp, Dover, DE, Mar. 1989-1992. - Operated by Aces High Ltd, North Weald, UK, Apr. 9, 1988-1995. World Jet Inc, Fort Lauderdale, FL, Jan. 30, 1995-2002. - Camera nose replaced by glasshouse nose, Kissimee, FL, 1996. - Flew as "Girls Rule". - Operated by John Lister, San Antonio, TX, 2000-2002. -- Flown as "Top Secret". - Flown as "Pacific Prowler". Paul Mantz, Grand Central Air Terminal, Glendale (later Orange County), CA, Feb. 19, 1946-1961. - Acquired from War Assets Corp, Seacy Field, OK, Feb. 19, 1946. 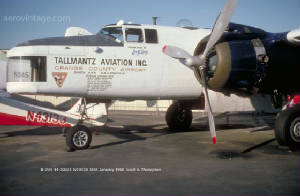 Tallmantz Aviation, Orange County, CA, Nov. 1961-1975. - Flew as The Bug Smasher. - Fitted with Cinerama camera nose. 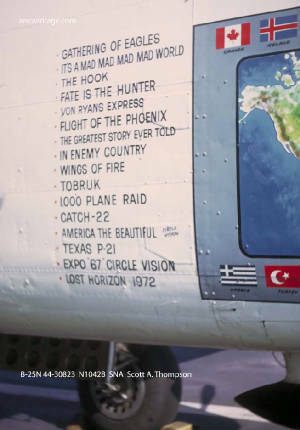 - Flew in movie "Catch 22", 1968-1969. - Camera nose removed circa 1971 and fitted to N9451Z. Howard Stucky, Moundridge, KS, July 1975-1976. Vicki Meller, Burbank, CA, Mar. 1976-1978. - Crashed in Columbia, Circa 1978. -- Reported crashed during drug running. 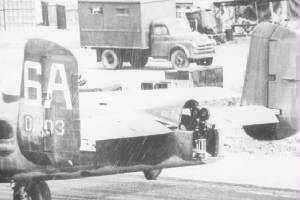 Delivered to USAAF as 44-30493. - Davis Monthan AFB, AZ, 1958-1960. Spring Aviation, Tucson, AZ, Aug. 27, 1960-1967. - Planned conversion to tanker. Tallmantz Aviation, Santa Ana, CA, July 13, 1968. Filmways Inc, Hollywood, CA, Sep. 11, 1968-1971. - Flew in movie "Catch 22" as Dumbo, 1968-1969. 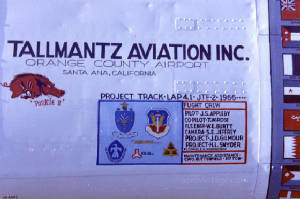 Tallmantz Aviation, Santa Ana, CA, Aug. 18, 1971-1985. Sherman Aircraft Sales, W. Palm Beach, FL, 1985. - Displayed on pylon as 430493. 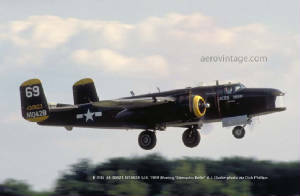 Delivered to USAAF as 43-28204, 19??. 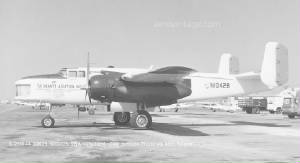 - Stored at Davis Monthan AFB, AZ, 1958. 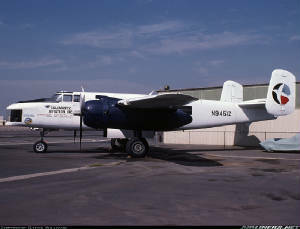 Blue Mountain Air Service, La Grande, OR, Sept. 18, 1958-1961. - Converted to air tanker, May 1959. -- Fitted with 1000 gallon tank. Idaho Aircraft Inc, Boise, ID, Mar. 1961-1962. Dennis G. Smilanch, Boise, ID, May 1962-1968. Filmways Inc., Hollywood, CA, 1968-1972. 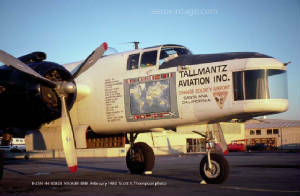 Tallmantz Aviation, Orange County, CA, Apr. 1971. Ted Itano, Borrego Springs, CA, 1972-1984. Ted Itano/Aero Trader, Chino, CA, 1984-2002. - Flies as 43-28204/Pacific Princess. 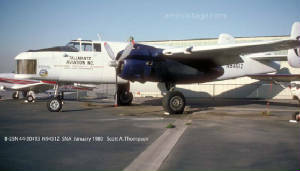 - Flew off carrier USS Constelation for movie Pearl Harbor, Sept. 2000. -- Flew in movie as 0203/Whirling Dervish. 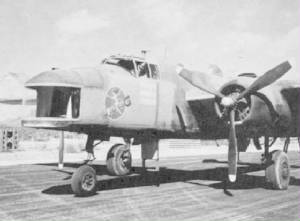 Delivered to USAAF as 43-28222, 19??. - Stored at Davis Monthan AFB, AZ, Dec. 1957-1958. Les Bowman, Los Angeles, CA, Jan. 13, 1958-1962. - Converted to air tanker, Apr. 1959. 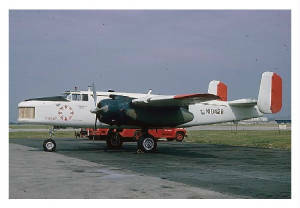 - Operated by Paul Mantz Air Services, Santa Ana, CA, 1960. -- Flew as tanker #81. 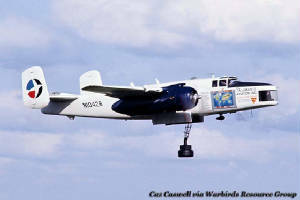 -- Flew to Caracus, Venezuala for fire bombing contract, Mar. 1960. Zack C. Monroe, Burbank, CA, Feb. 1962-1963. - Fitted with agricultural spray bars, June 1962. Les Bowman, Los Angeles, CA, Nov. 1963-1964. Cal Nat Airways, Grass Valley, CA, Nov. 1964-1970. - WFU, engines stripped, Grass Valley, CA, 1968-1978. Gary R. Larkins/Air Pirates, Auburn, cA, 1976-1978. Ralph M. Ponte, Grass Valley, CA, May 1978-1980. USAFM, Beale AFB, CA, Aug. 1980-1993. USAFM, Hurlbert Field, FL, Apr. 1995-2002. - Displayed initially as 28222, later as 02344. 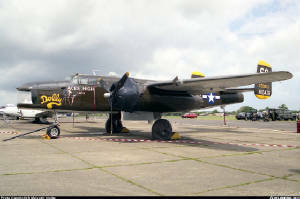 Delivered to USAAF as 43-3376, 19??. 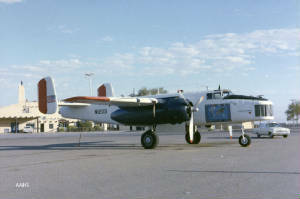 - Stored at Davis Monthan AFB, AZ, May 1957. Les Bowman Engineering Co, Long Beach, CA, Sept. 12, 1957. Paul Mantz Air Service Corp, Santa Ana, CA, Oct. 1957-1969. - Converted to fire tanker. - Based out of Caracas, Venezuela, 1961. Removed from U.S. Civil Registry as destroyed, June 1970. 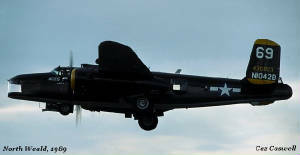 Delivered to USAAF as 44-29035, 19??. - Stored at Davis Monthan AFB, AZ, Dec. 1957-1959. National Metals Co, Tucson, AZ, July 7, 1959. Les Bowman & Paul Mantz, Santa Ana, CA, July 1959. - Converted to firetanker, Nov. 1959. -- Fitted with 1,200 gallon tank. - Operated by Paul Mantz Air Service as tanker #82, 1960. - Flown to Caracas, Venezuala for fire tanker contract, MAr. 1960. Delivered to Venezulan AF as FAV 4146, 19??. - WFU, open storage, El Libetader AB, 1980-1991. Steven A. Detch, Alpharetta, GA, 1992. Military Aircraft Restoration Corp, Chino, CA, OCt. 1992-1993. David C. Tallichet/MARC, Jan. 25, 1993. Tony Mazzolini/US Aviation Museum, Cleveland, OH, July 1993-1998. - Trucked to Cleveland for static restoration for NMNA. - Completed, Beaver Falls, PA, Mar. 1998. National Museum Of Naval Aviation, NAS Pensacola, FL, Mar. 1998-2002. 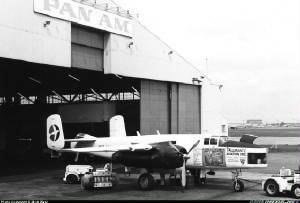 - Displayed as USN PBJ-1D/35087/MB22. 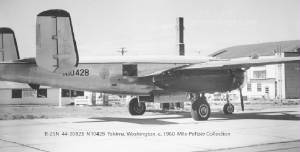 Delivered to USAAF as 44-30210, 19??. - Open storage, Aug. 1958-1959. - Surplused at MASDC, Davis-Monthan AFB, Dec. 31, 1959. National Metals, Phoenix, AZ, Jan. 15, 1960. Les Bowman & Paul Mantz Air Service, Santa Ana, CA, May 1960. - Converted to fire tanker, Aug. 1960. - Used as tanker, based in Caracas, Venezuela, 1961. Les Bowman Engineering Co, Long Beach, CA, Nov. 1960-1962. - Flew as tanker #82. Zack C. Monroe, Burbank, CA, Feb. 1962. Les Bowman, Long Beach, CA, Nov. 1963. Cal-Nat Airways, Grass Valley, CA, Dec. 1964-1970. - WFU, open storage, Grass Valley, CA, 1963-1968. 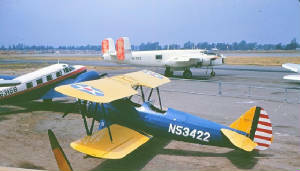 Sis-Q Flying Service, Santa Rosa, CA, Feb. 1970. Daryl M. Jackson, Moses Lake, WA, Sept. 1970-1975. David Tallichet/Military Aircraft Restoration Corp, Chino, CA, Jan. 1975-2002. - Ferried to Luton UK for movie Hanover Street, May 11, 1978. -- Flew as 151863/Big Bad Bonnie. - Stored Blackbushe & Dublin, 1978-1981. - Operated by Jeff Hawke/Mitchell Flight, Cranfield, May 1981-1983. - Forced landing after engine failure, Aix-en-Provence, France, July 1982. -- abandoned, Avignon, France, July 1982-1983. - Warplane Flying Group, Wellsbourne Mountford, 1983. -- Ferried from UK to Chino, CA, Aug. 1, 1986. 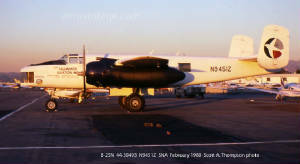 - Loaned to USAFM, March AFB, 1987-1990. -- Displayed as 30210/Big Bad Bonnie/8U. - Open storage, Chino, CA, 1991. - Restoration project, Chino, CA, 1997-2000. 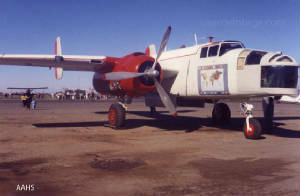 Built at NAA's Kansas City Plant, late 1944. 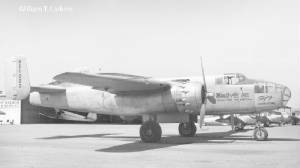 Delivered to USAAF as 44-30748. Ace Smelting Inc, Phoenix, AZ, May 19, 1959. - Registration N3447G reserved but not taken up. - Acquired as surplus for $1,143. 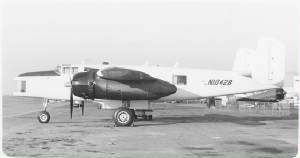 Alson-Niblock Flying Inc, Elkhart, IN, May 1959. Christler & Avery Aviation, Greybull, WY, Dec. 1959-1963. - Fitted with agricultural hopper & spray bars installed, Jan. 1960. Avery Aviation, Greybull, WY, Aug. 1961-1968. Filmways Inc, Hollywood, CA, 1968-1972. - Flew in movie "Catch 22" as "M&M" and "Miss Renee", 1968-1969. 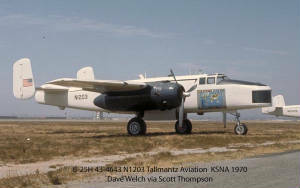 Tallmantz Aviation, Orange County, CA, Aug. 1971-1972. Milan S. Pupich, Van Nuy, CA, Mar. 1972-2002. 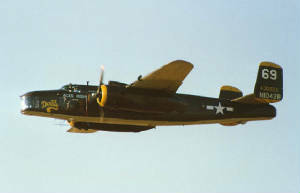 - Restored to airworthy status, 1972-1974.
the 50th anniversary of the Doolittle Raid, 1992. - Complete Upper Gun Turret and tail gun assembly installed, Mar. 1997. - Flown as 430748/Heavenly Body. -- Scheme of Heavenly Body, 390th BS, 42nd BG, 13th AF. – BOC: Feb. 7, 1945. Fogle Aircraft, Tucson, AZ, Sept. 9, 1959. Christler & Avery Aviation, Greybull, WY, Jan. 1960. - Flew in movie "Catch 22" as Vestal Virgin, 1968-1969. Ed Schnepf/Challenge Publications, Van Nuys, CA Feb. 1972-1978. Challenge Publications, Van Nuys, CA, 1978-1984. 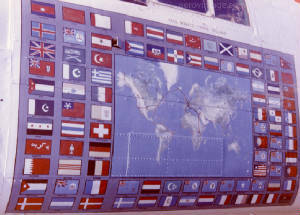 American Aeronautical Foundation, Van Nuys, CA, July 1985-2008. - Flown as 430801/Executive Sweet. 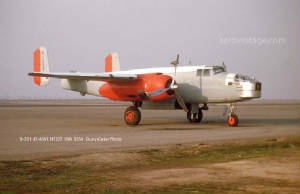 Delivered to USAAF as 44-31042, 19??. National Metals Inc, Phoenix, AZ, July 28, 1959. Les Bowman & Paul Mantz AirServices, Orange County, CA, July 1959-1960. Les Bowman, Los Angeles, CA, Nov. 1960-1962. Les Bowman, Los Angeles, CA, Nov. 1963. Cal Nat Airways, Grass Valley, CA, Dec. 1964. Reported for sale by U.S. Civil Register, 1966-1970.